It has really felt like the last day of the year, though. Lotsa things went wrong. Photos got deleted. I broke a camera. My mother broke both a bowl, AND her best sewing machine. FML, etc. 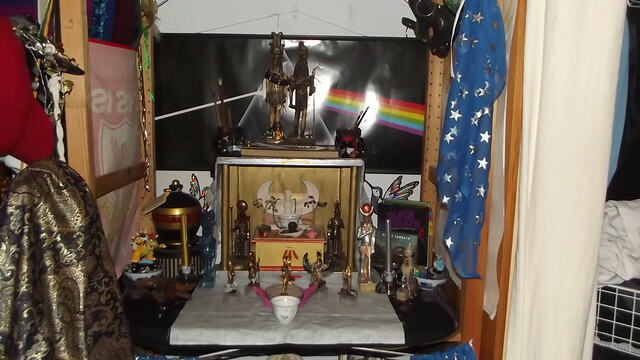 But I did get my shrine redone properly, finished two sets of liturgy for Wep Ronpet, and for the next equinox, AND I wrote 1000+ words today, so! Counting my victories and all that. Took the chance to take everything down and clean it, since sometimes I need to do that, and to make it a little less cluttered. My shrines are good at gathering clutter. So sometimes I need to cut it down. And the last day of the year seems like as good a time as any. I like Wep Ronpet, anyway. I like that chance to start anew. I don’t know how much of a coincidence that I set it to fall on the same day as Lammas, but eh. I think it’s kinda cool, and seeing Lammas as a first harvest, and also taking the chance, at Wep Ronpet, to look back at what I’ve achieved, and to look forward at what’s to come, seems like a good thing. I’ll decide on whether to do some traditional isfet smiting during the ritual, or at a separate time. I think it’s always better to focus a ritual on a single goal, rather than try to do several things at once. So I might leave the smiting til later. It’s nearly Wep Ronpet according to my calendar, which caught me by surprise. I missed Wesir’s birthday completely and had to make up for it the next day when I honoured Heru-Wer. It’s been good, though. This week has felt really busy because of this, and because I’m gearing up for another Sabbat-y thing in February that is not going to be either Imbolc or Lammas but something else I haven’t thought of yet that might just end up being ‘OH HAI HESTIA ILY’ with appropriate offerings and FIRE. Or something. /slacker Pagan strikes again. Anyway. So I had these five candles on my top shrine for the Children of Nut and Geb, but had no way of marking them, and not just because it has been Period Tiem! and I have been reluctant to touch my icons to move them. (That, and I don’t have a little statue for Heru-Wer like I do for the others! 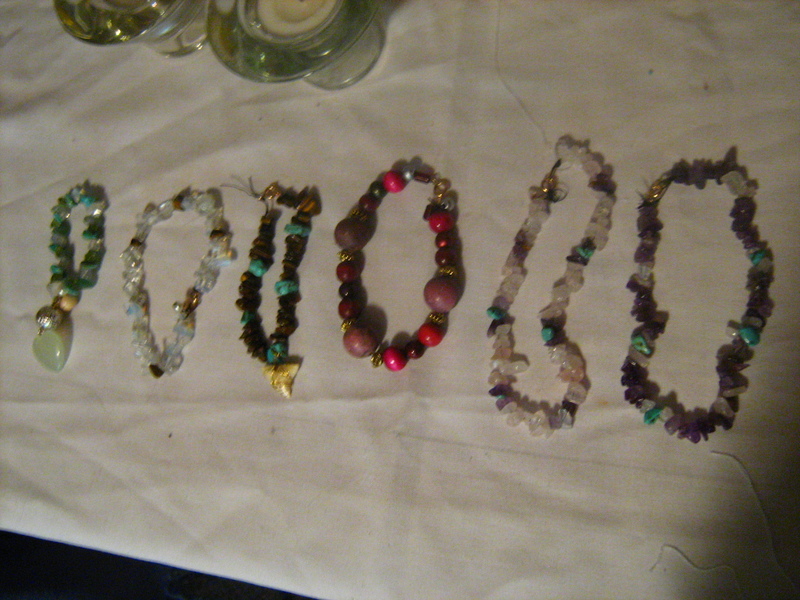 D:) But it’s over now, so I decided to spend the afternoon making little beady thingos to go with each of the candles to mark which one is which. I don’t do it very often, and it always takes me a while to remember the best way to thread and tie things off properly. I want to do more of it, though. It’s a creative thing I can do that doesn’t make me feel completely incompetent by the time I’m done.